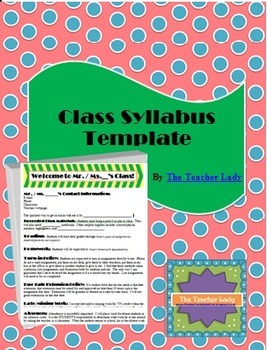 Don't know where to start in creating your class syllabus? 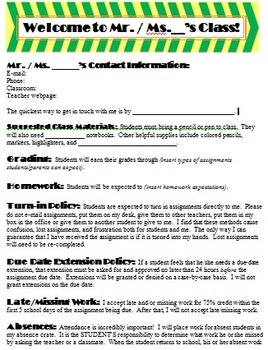 This attractive template will help you make your class syllabus clear and professional while saving you time! It includes sections such as "Contact Information," "Homework," "Late Policy," "Suggested Materials," and "Discipline Policy." 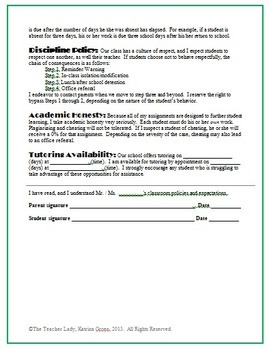 It also gives suggestions on how to word these policies for students and parents. Finally, it asks for a student and parent signature, which is a great way to ensure that students and parents are aware of your policies, should any issues arise later in the year!